Editor's Note: Health Qigong is an important component of Traditional Chinese culture. Over the last few years, remarkable achievement has been made in the cause of Health Qigong. Vigorous cultural development and prosperity raised in Six Plenary Session of the 17th CPC Central Committee, added new requirements to development of Health Qigong. As a participant in administration and supervision of Health Qigong, the author deeply thought the ongoing work and rearranged it, after studying spirit of the plenary session. The piece titled with From Culture to Civilization manifests the author's real inspiration that the glorious mission - heir to outstanding traditional culture - should be assumed consciously in the aspect of vigorous development and prosperity of socialist culture. When mankind's mind resonates with the outside world, he creates languages to express his feelings - the ability of which forms the basis of humanity. When mankind can feel the world by soul and heart, and when he wants to express such feelings in their mind, languages are created. With the development of language, a diversity of cultures is preserved on its way. When culture between pages flows to real life, and when walking down the temple to normal people, it becomes the one to advance development of human society. It is the feelings echoed in my heart when I am studying spirit of Six Plenary Session of the 17th CPC Central Committee. The Resolution passed in the plenary session for the first time set forth the Chinese path to be a cultural power in terms of cultural program, goal and policies, making an epochal contribution to development of Chinese culture. What is the purpose of cultural development and prosperity? It provides a better life to the people - kids have more sweet smile, and the elders lead more comfortable life in a more civilized and harmonious society. Mankind developed his civilization for a long time, during which, tools and technologies could be copied, and administration could be referred. And culture, the only spiritual bloodline casted in national soul, has its extreme autonomy, and represents the degree of a nation's civilization which is engraved on distinguishing features of a nation. Advanced culture presents its appearance in many areas, such as eduction, sports, health care, scientific research and social life. While cultural development of industries accelerates development and prosperity of socialist culture, and progress of civilization. Chinese sports program is an integral part of development of socialist culture. Its integration of political influence, economic productivity, cultural communication, and social intimacy reflects soft power of civilization. Comrade Mao Zedong in his early years mentioned,"Sports, is a vehicle of knowledge and house of morality". Today sports still plays an important role in fitness, improvement of heart pumping, puzzle capability, and socials via its specific approach and abundant connotation. As for public affairs, only integrating the mission of building socialist culture into our daily work and practice is the best interpretation and inheritance of national culture and the best creation and development of social civilization. I’m a sports worker, properly speaking, an ordinary person serving the development and propagation of Health Qigong. 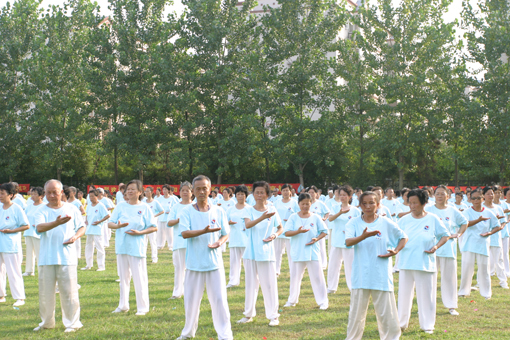 Among various sports, Health Qigong is favored by people for its unique cultural connotation and time-honored historical inheritance. She seems to be a beautiful picture scroll that records history and inherits culture. Experiencing her development by oneself is some sort of happiness. The Six Plenary Session of the 17th CPC Central Committee pointed out: creating more excellent works living up to history, times and people is an important symbol of the prosperous development of culture. It requires workers from all walks of life to be equipped with a strong sense of social responsibility and keep distance with fickleness, but close to life. Recreation and sports practitioners need to pay more attention to life to create more soul-stirring works; educators educate people, impart knowledge and cultivate excellent talents with both ability and political integrity. As for Health Qigong, what works can integrate it into cultural development? How can it return people? As an important part of the excellent traditional culture of Chinese nation, Health Qigong combines the idea of “harmony between mankind and nature”, the method of “training mind and body”, and various schools of thought like Confucianism, Buddhist thought, Taoism. That Health Qigong can be preserved until today after a decade is thanks to her inclusive beauty and effect of morality cultivation and health preservation. This national traditional sport brings healthy and harmonious mind and body, elegant and pristine beauty. Inherit, develop and promote Health Qigong to benefit human health; spreading this tree of culture to the world is the little contribution our Health Qigong workers make to the cultural development and prosperity, and to the promotion of social civilization.